OSWEGO – Join the VOW Foundation and a number of local service providers on Saturday, October 13, from 10 a.m. to 6 p.m. at the Lake Ontario Event and Conference Center, 26 E. First St., for the annual Addiction Awareness Walk. Last year, more than 70,000 people lost their lives to a drug or alcohol overdose in the United States. This event is a celebration of life and recovery, and focuses on the impacts of substance use and abuse on our communities. Speakers from the community will share their stories of addiction and recovery and trainings will be provided to teach attendees how to use Narcan, the overdose reversal drug. Local rockers Dirtroad Ruckus will perform throughout the afternoon, so bring your dancing shoes. The hope is to educate members of the community about the dangers of substance abuse and link them to meaningful resources available locally. Above all, organizers want to provide a sober space that is fun and exciting. 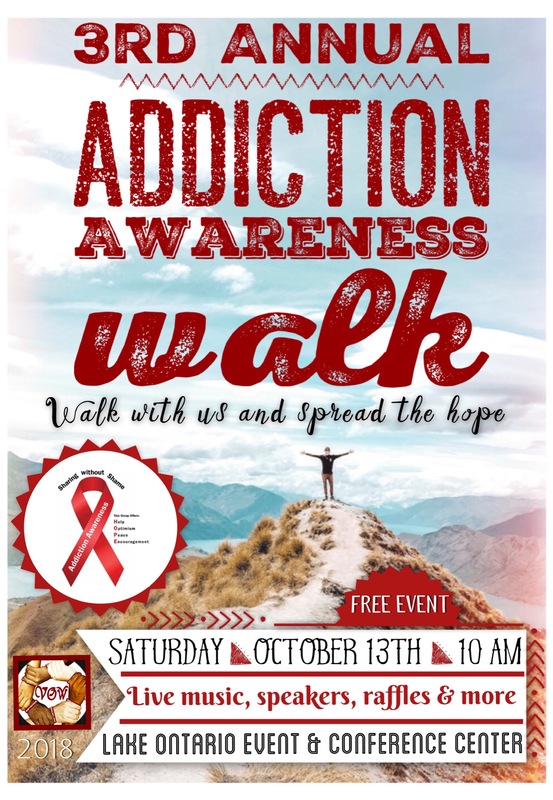 The Addiction Walk is free and open to all members of the public. Free snacks and refreshments will also be provided. A children’s activity table will be available, Narcan kits with instruction will be available all day long as well as drug disposal kits provided at no charge. Service providers on hand include Farnham Family Services, County of Oswego Council on Alcoholism and Addictions, Harbor Lights Chemical Dependency Services, Helio Health (formerly SBH), Liberty Resources, Oswego County Opportunities, Fidelis Care, VOW Foundation, In His Strength Ministries, AA/NA Groups, and the Oswego County Prevention Coalition. Registration is encouraged for all attendees and includes a free drawing entry for a T-shirt. Registration forms can be found at the VOW website. For more information, please visit the VOW Foundation at www.vow-foundation.org. 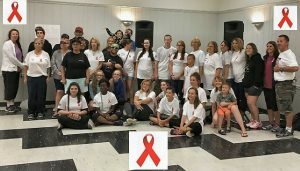 We would like to thank the following organizations for pledging their support: Central Region Addiction Resource Center, Fidelis Care, Sunoco Ethanol Fulton, Rural Health Network of Oswego County, Eastern Shore Associates, Farnham Family Services, Compass Credit Union, BioSpherix, Fulton Savings Bank, Laborers Local 633, Universal Metal Works, Planned Results, Inc., Hastings VFW Auxiliary and Carol Dillabough. Links to the sponsor websites can be found on the bottom of the VOW Foundation website. Planning this year’s event include representatives from the VOW Foundation, County of Oswego Council on Alcoholism and Addictions, Helio Health, Liberty Resources, OCO SPOT and Health Ed, Reality Check and Joslin Farms. Thank you for product donations from Eagle Beverage, Joslin Farms and Ontario Orchards. Donated Raffle Baskets will be available with proceeds to benefit the VOW Foundation. If you or your organization would like to donate a raffle basket, please contact Teresa Woolson at (315) 402-6119.